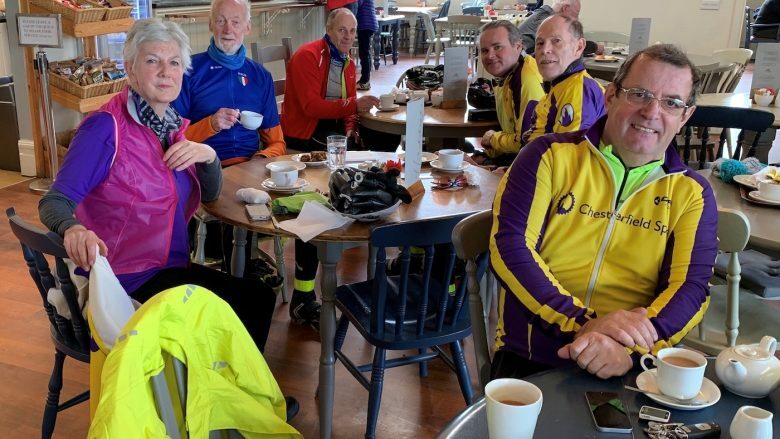 The feature photo was taken on Tuesday 9 April 2019 and shows the “Touring ” group enjoying their morning coffee stop in the Hassop Station cafe. They later met up with the “Faster” groups at the Eyam Tearooms for lunch. Photo courtesy of Michael S.
The Spire is one of the oldest established cycling clubs in the country with a history of successful competitive riders. These days the predominant activities are the regular Weekday, Saturday and Sunday rides around the locality and further afield. Members are also involved in touring, Audax, competitive time trials and various other cycling activities. The club meets every Monday evening at the Chesterfield Community Centre. We are a friendly welcoming bunch offering advice and encouragement to new riders. Amongst our ranks there is an intriguing amount of route, technical and most importantly cafe knowledge, adding that extra something to your cycling experience. Non-members are very welcome so why not experience a couple of rides with the club – it may be just what you are looking for!! Our club membership is only £5 per year (see our membership page for information about joining).